In this episode, we enter the cutting-edge world of chatbots. 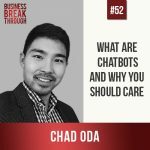 Chad Oda, an expert in chatbots explains how to set up chatbots to engage with your customers so that you don’t have to. From how much they cost, to the different types and the platforms that you can use them on, Chad covers everything you need to know. 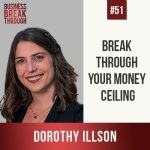 He also shares his relatable struggle of how to navigate unchartered waters in this groundbreaking industry, and how to create a framework to assess which opportunities to go after when you have so many potentially amazing offers. We often consider the opposite of pain to be pleasure, but in reality it’s comfort- and that desire for comfort keeps many people stuck in negative or less than ideal professional situations. Today we’re joined by Chris Desmond who show us, with a blend of physiological and psychological insight, that being uncomfortable is not only OK, but actually leads to growth and happiness.